Ideally, most customers want their compression spring to have a constant rate. This means that if it takes 10 pounds to deflect the spring from 6 inches to 5 inches, it should also take another 10 pounds to deflect it from 5 inches to 4 inches. In other words, the pounds-per-inch should be consistent in a cylindrical compression spring. But if the machinist manufacturing the spring varied the space between the coils, the compression spring could have a varying rate. The automatic spring winders were a big advancement for the manufacture of compression springs. The fundamental difference between the automatic spring winder and the lathe was that the automatic spring winder “pushed” the wire around a very short arbor rather than “pulled” it around a longer and more expensive mandrel. With the arbors now being much shorter and less expensive, precise arbors could be used to get specified results. In addition, the automatic spring winder had a mechanical device that created the space between the coils. This device resulted in much less deviation from coil to coil, resulting in a much more precise rate for the compression spring. The automatic spring winder not only greatly improved the precision of the compression spring—it greatly increased the output. 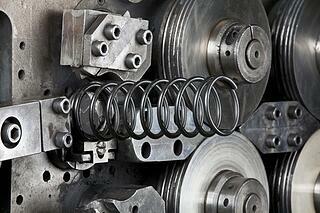 Here’s why: when winding a spring on a lathe, it is only a semi-automatic operation. The operator must to stand there and wind each spring, one at a time. With the automatic spring winder, the machine could be set up, allowing the machine to make the springs automatically. If it were a longer run job, the machinist was free to leave the machine alone and begin to work on another spring. The automatic spring winder was a great improvement for compression springs, but it still was not perfect. When desiring a non-cylindrical compression spring, such as a cone-shaped compression spring found at the bottom of a flashlight, the mechanical automatic spring winder was still difficult to use. Cone-shaped compression springs are used when the spring has to deflect to a very short space, such as in the flashlight. Tools had to be ground to a specific shape to “cone” the spring to the desired shape. Once these tools were ground, they could not be used to make other springs. In addition, sometimes the end-user of a compression spring does not want the space between the coils to be identical. If the end-user wants the compression spring to be weak at the beginning of its deflection and stronger near the end of the deflection, the spring designer accomplishes this by varying the space between the coils on the compression spring. With the mechanical automatic spring winder, this too, was a difficult job. The computer numerically controlled (CNC) spring winder was a great advancement for winding compression springs. A computer now controls the movements of the spring winding machine rather than cams (such as the cams found in the cam shaft of an engine). This enables the machinist to program the machine to make a cone-shaped compression spring or a variable pitch (similar to space between the coils) compression spring without permanently altering the tooling. In addition, once the CNC spring winder is programmed, when that spring needs to be re-manufactured a second or third or 10th time, the machinist can merely recall the program and a great deal of the work is already done. And, CNC machines are not through yet. They are becoming more and more advanced—to the point where much of the CNC programming can be done by interfacing with compression spring design programs. 150 Years of Continuous Spring Manufacturing! I’ve been in this business for many years. In fact, I’ve been with Hardware Products Company for 42 of its 150 years in business. We’ve seen many innovations (been in the forefront of a few) and changes to the methods and scope of the spring industry—and the impact they have made on life as we live it. Springs—some tiny, some gargantuan, play many roles in our lives. We take pride in having delivered quality springs—compression, flat, torsion, wire form, retaining rings, and extension springs—for 150 years. Whenever we talk “springs” to the uninitiated, they are surprised to find out just how many springs they rely on for everyday purposes. From the obvious, like watches, toys, bicycles, and ball-point pens, to the not-so obvious: medical devices, bridges, bathroom scales, ovens, various modes of transportation, and mousetraps. We are thrilled to be celebrating 150 years of continuous spring manufacturing in the USA. In spring manufacturing, we have the capacity to create virtually any shape and type of spring with a wide variety of spring steel—for an array of uses. Contact one of our spring geeks today to find out which spring steel will work best for your next project.